A Midwesterner from the Windy City, Mary Dana Abbott currently resides in New York where she is Creative Director of Laughing Lotus. She first found herself on a yoga mat over 25 years ago when her Dad would take them to a Hatha Yoga class at the local dance center. Since then she has studied numerous diciplines and styles, finding Laughing Lotus in 2004- and pretty much never leaving. 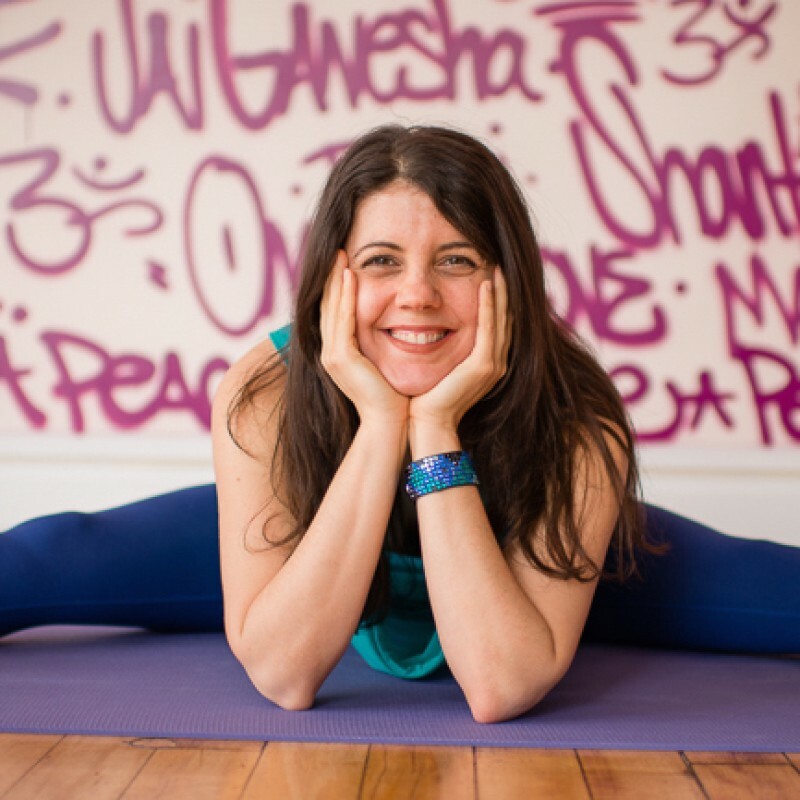 Known for detailed attention to alignment and precise transitions, her classes are thoughtful explorations of asana designed for anyone to reach their fullest potential. She believes in an easy-going approach that makes the practice fun and spirited and always has pitch perfect playlist to match the movement. Mary Dana has lead teacher trainings and taught workshops both coasts and three continents. She thanks her teachers Dana Flynn, Jasmine Tarkeshi, Sharon Rudy and all her students for their constant inspiration. Lots of standing poses, balances and fun shapes await in this short and sweet practice deigned to get you flowing into your life. A short and sweet practice designed to get you prepped and ready for flying pigeon pose. Get ready to get into your hips in no time! A fun, functional and flowing exploration of your hips and hamstrings. Get organized and feel sculpted from the inside out as you work toward hanumanasana, or split pose, safely and with anatomical integrity. This hour of power will help you align your pelvis, lower and upper back in common asanas and transitions, while exploring some new ones as well. Explore "the backbend before the forward bend," and go deeper into your practice with accessible and smart alignment. This class explores the subtleties of internal and external rotation at the shoulder joint and the many asanas that require attention to this joint-action in a fun and accessible Vinyasa Flow format. Core strengthening, hip and hamstring opening in less than twenty five minutes! Do this 30 min sequence before and/or after travel. Great for hip, hamstring and lower back mobility. Twists, hip and hamstring openers highlight this practice. Enjoy! A sequence exploring "chest bandha", a cue that helps you engage the upper abdominals, and activation of the hamstrings to take the body into a number of asanas. Primary focus is prepping the body to "float" into forearm stand, and working towards the hollow back variation. A fun and solid hour of hip openers and arm balances, where you will explore unique transitions purposely designed to take you to new ground in your practice.